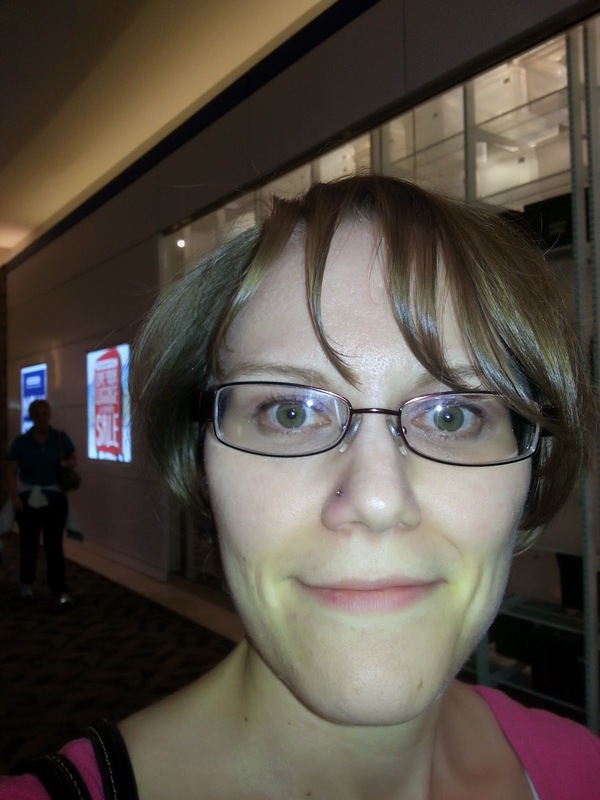 Here's the story behind the nose piercing! 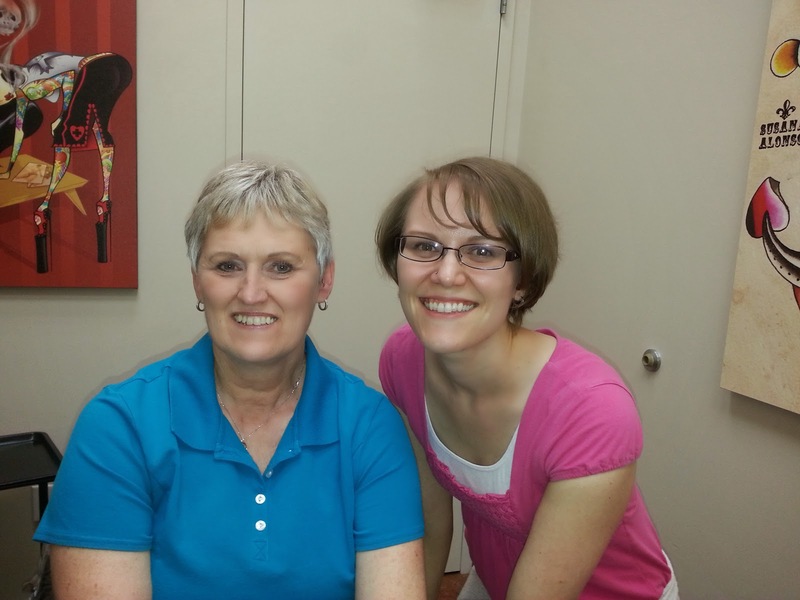 On Memorial Day my Mom, SIL Stephanie, two Aunts and I all went shopping together at Southcenter. My Aunt had blessed Stephanie with a new piece of luggage so she told me to find something that I liked and she would pay for it. I was thinking and couldn't really think of anything that I really needed. Then we walked by the BJP (Body Jewelry Plus) store and I just jokingly said, "Will you pay for my nose to get pierced?" Surprisingly she said yes and she wanted to get her Tragus repierced. That's when I got that funny feeling in my tummy thinking...do I really want to do this. We did a bit more shopping and then took a break at Starbucks where I finally texted Michael to see what he thought about it. He texted me back and said if I wanted to then go ahead. That's when I texted my friend Erin to chat with her since she has her nose pierced and I was freaking out thinking it was going to hurt so bad. She encouraged me by saying...."You've had 4 C-Sections!!" After a bit more back and forth I finally told my Aunt Linda..."Let's do this before I change my mind!" I finally decided that life is short and this is not something that's permanent! I can take it out at any time and you won't even know that I ever had it. My brother had offered to pay for me to get it pierced for my birthday last year, but I just wasn't ready then. This was the time and it was so fun to get to do that with my Aunt. Good memories! Only one person was able to come into the room with me and in a matter of 30 seconds or so I had all this go through my mind. Oh of course I want my mom....wait maybe I should ask Stephie to come in since she's had her nose pierced before...wait my Aunt is the one paying and she's getting her tragus repiercer....Aunt Linda! The first thing I told the guy was I was so nervous. He had be sit down on the table and then he cleaned my nose inside and out and then made a dot where the piercing was going to go. He ended up making a second one since he didn't like the first one. Then I checked it out and gave him the all clear. That's when I laid down and before Aunt Linda even got to put my glasses down and get the camera he was already starting the process. I cried...."Aunt Linda I need your hand!" The he said..."Deep Breath" and it was over! I have heard people say it doesn't hurt, but seriously I was thinking they were crazy nuts! But in all honestly it seriously did not hurt at all! My eyes didn't even tear up! I've had much more pain from plucking my eyebrows! 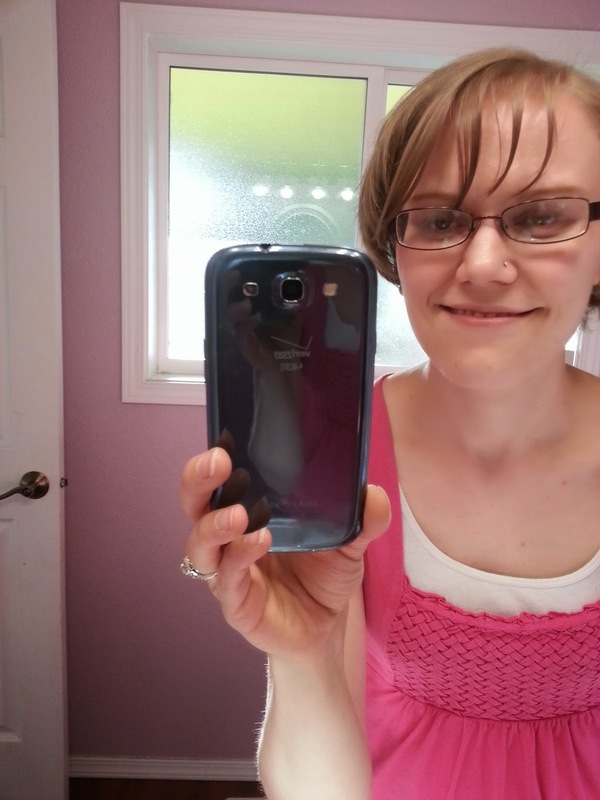 My first selfie right after we were all done! 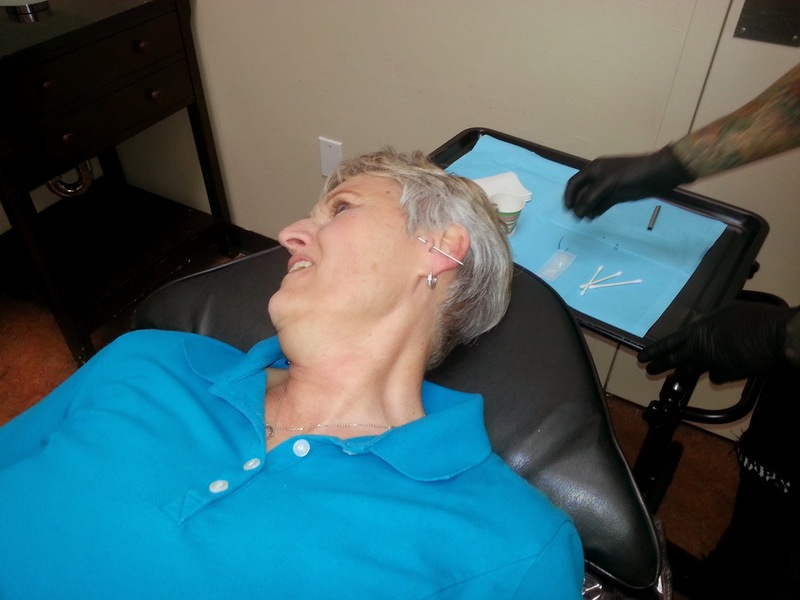 Like I said Aunt Linda got her Tragus repierced. She was great and she said hers didn't hurt either! The guy was nice enough to take our picture! He was a sweetie and definitely well versed in piercings! Of course Michael gave me a funny look when I came home, but he's fine with it. He just said it was going to take a little while to get used to it. The funny thing was it took a couple hours for any of the kids to even notice it. Of course Jackson was the first...he's so observant. He asked...."What's that on your face?" He doesn't like it, but he's also the kids that says I look strange when I come in with a new hair cut. It will grow on him! It took Owen a full day longer to even notice it. He doesn't mind! The next morning my nose was a teeny bit sore, but nothing bad. I also can barely feel it at all. The only thing I have to keep track of is if the part inside my nose is turned wrong you can see it so I have to make sure it's tucked in. So far I'm happy with my decision. I think it looks nice and it was fun to make a great memory with my Aunt. This project is months if not a year in the making. When I bought Ella's new comforter on Craigslist it didn't come with curtains so I went to Joann's and found this fabric. I was sure I could sew a simple valance. Yeah it wasn't so simple since the fabric was kind of see through once you put it up to the light so that meant I would need to make a lining for it. 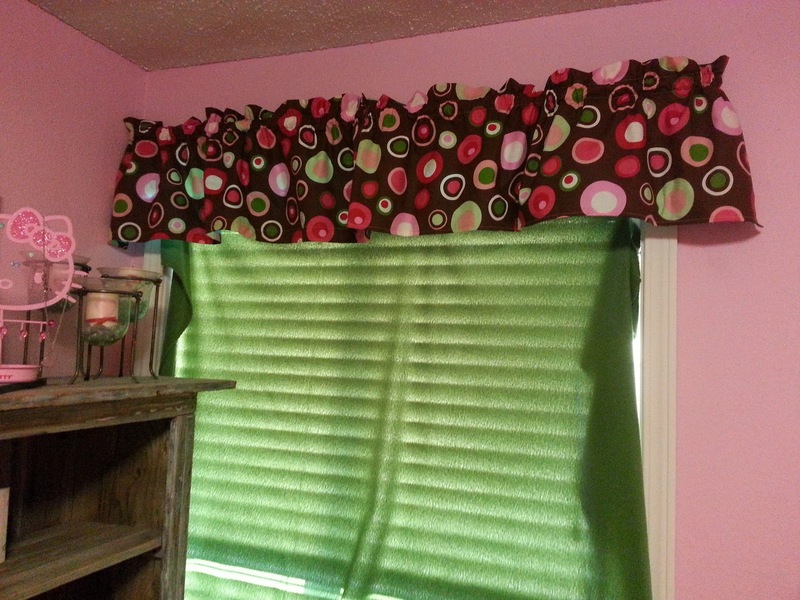 I also wanted to make sure that not only did it have a pocket for the curtain rod to go through, but I wanted a little bit of fabric above the curtain rod to give it the same look as the store bought ones. I tried to pin it and figure it out without a pattern, but then I just got totally frustrated so I tucked the fabric away and forgot out it. Then I went to the fabric store with my Mom and I was reminded about it. So I ended up fishing it out and was determined to finish what I started. It ended up not being that rough at all. I was able to sew two valances in under 2 hours. I think the difference between now and back then is the fact that I've just been sewing more and my confidence and understanding of sewing has just grew over the months. I was really pleased with how they turned out and it's nice to be able to show the kids that even when you struggle you can walk away, come back and then try again! Oh and don't mind the blanket hanging in the window...that is our ghetto version of a room darkening shade! Since September is going to be here in no time I'm already gearing up for our Disney trip. I'm so glad we decided to postpone our trip a year. Last year would have been fun, but this year will be better since Zeke is walking! Since we've had a whole other year that means I've gotten to do more Disney crafts. My goal is that we will avoid a lot of the I want this and I want that since the kids will already have lots of Disney stuff. I know that we will still have to deal with the questions, but it will be easier to defuse the situation if I can say, "Oh you don't need that because there is a Disney surprise waiting for you back at the hotel!" 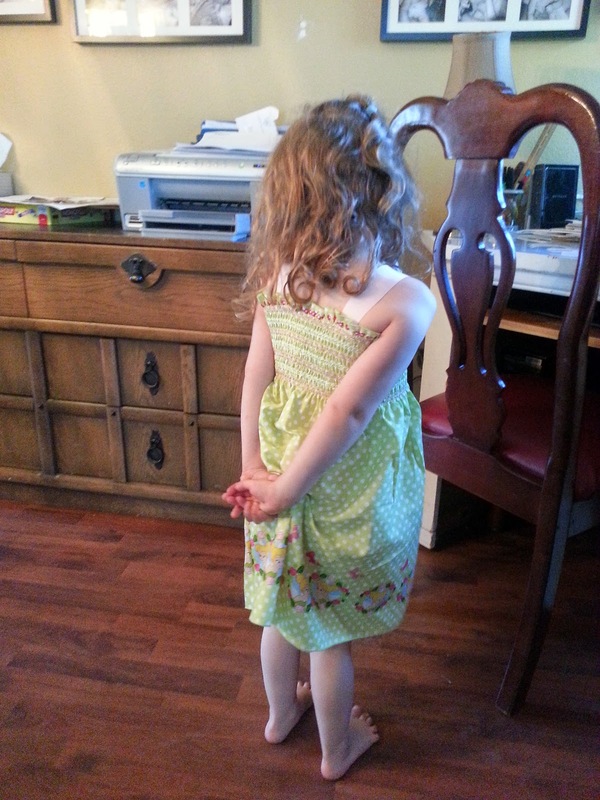 My most recent craft project was this cute smock dress. Joann's has this fabric and it's already smocked which makes it SO simple to make. I literally just bought the fabric and then pinned it with the right side facing each other and sewed a straight line! Since we are big about modesty I did not want the dress to be able to fall down or be pulled down so I went ahead and stitched on some ribbon straps to keep the dress where it needs to be. Ella is hold her hands funny so that's why the dress is pulling up funny in the back. The nice thing is this particular fabric was 30% off and you can buy it by the inch. I just had the lady pull out some fabric and then I folded it over to see if it was about Ella's size and then I added just a couple more inches to be sure and that was it. It was less that a yard of fabric and it cost $7. For a Disney dress I don't think that's bad at all...if you were to buy a Disney dress like this at Disneyland it would probably cost at least $24.99. 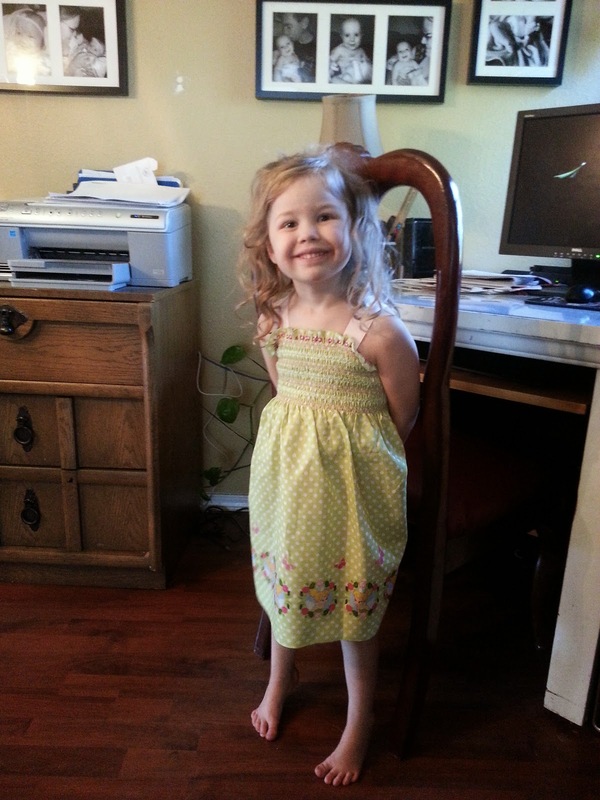 The fact that it was so easy and so inexpensive I'm planning on making at least one more dress for Ella. It will be hard to choose which fabric since they have Minnie Mouse, My Little Pony and Hello Kitty. 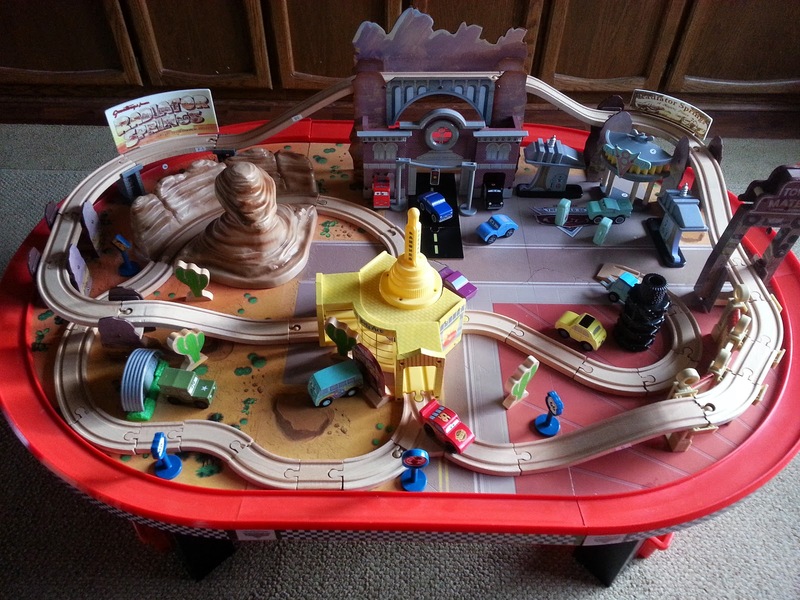 Here's Zeke's Cars table. A few months ago I started looking online for what Ga-Ga & Pa could get Zeke and I found this and knew he would love it! One problem though...they don't make this table anymore. I found it on Ebay for over $300...yeah right! Then I found it on Craigslist from a lady just across the border. One problem was I can't cross the border since I don't have a passport or an enhanced drivers license. I tried to see if the lady could meet me, but she couldn't cross the border either. She wasn't willing to mail it either. I was so bummed, but then I decided to check out the Portland Craigslist site. That's when I found one for sale from a guy in Longview which is over an hour from us. I contacted him and asked if he'd be willing to drive a little bit north and meet. Turned out that he's in the military so he met me just outside Fort Lewis. It was so perfect and it was not over $300! 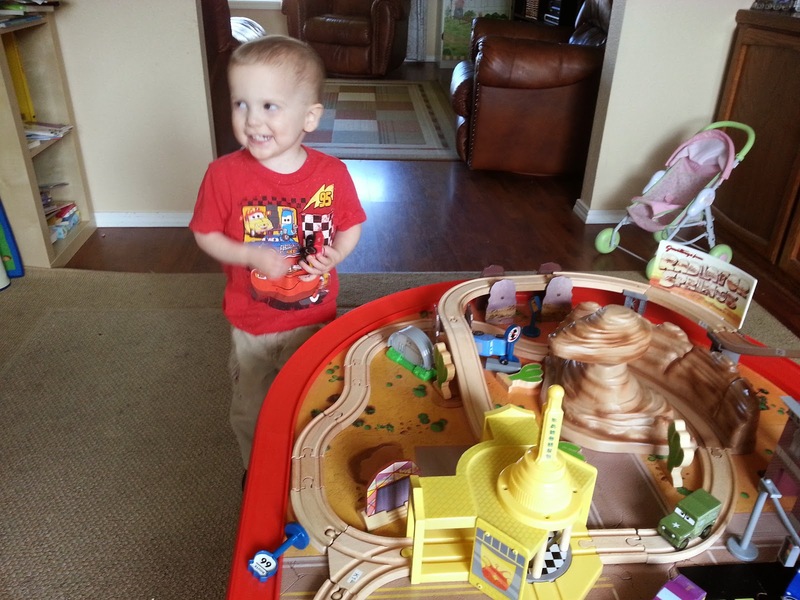 After all the kids went to bed on the night of Zeke's party Michael moved the table from the garage into the playroom. 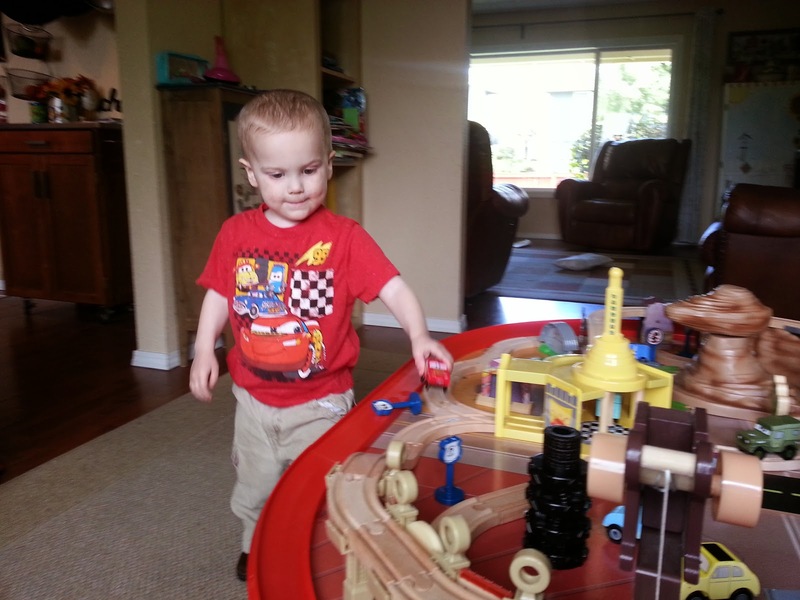 He loves driving his cars! Around and around the table! Of course McQueen is his favorite car to drive. The only thing that has given us a bit of trouble is an elevated portion of the track that keeps coming apart if the kids push on the track too hard. I hear "track" many times a day and I know that means I need to come fix it! It's Like Riding A Bike! 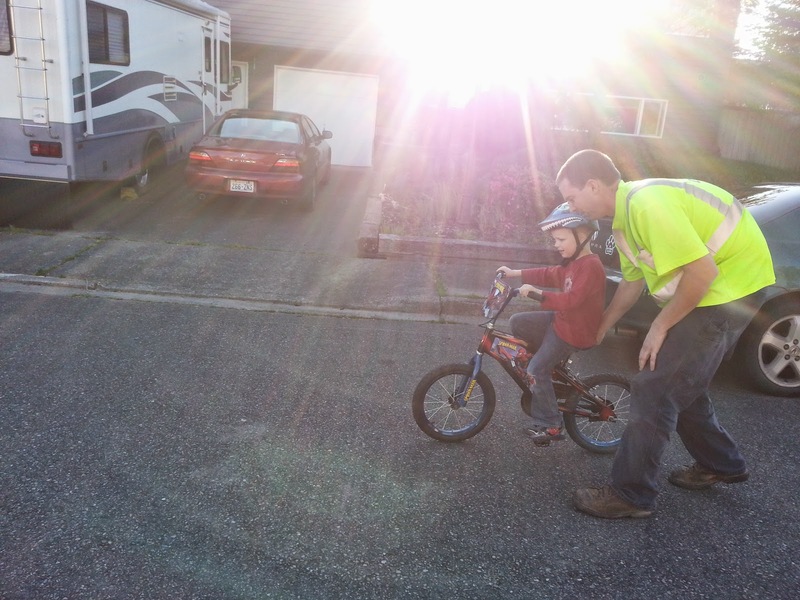 The time has come to teach another child how to ride their bike. We have talked about teaching Jack this summer and every time we mentioned it he was against it. Thankfully the closer we have gotten to summer the more receptive he's gotten. Michael has only worked with him once so far. 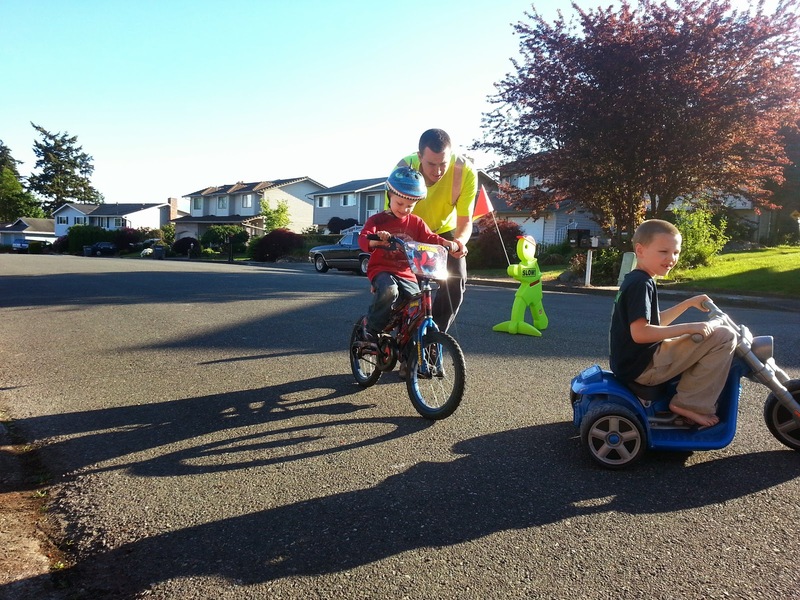 The first thing he teaches them is the balancing and steering. If you've read my blog for a while you might remember that Jack has gone to occupational therapy for his dexterity. One of the other things they worked with was his core strength. He is still struggling with finding his balance so that might take a him a while to figure out. That just means he'll need lots of practice! 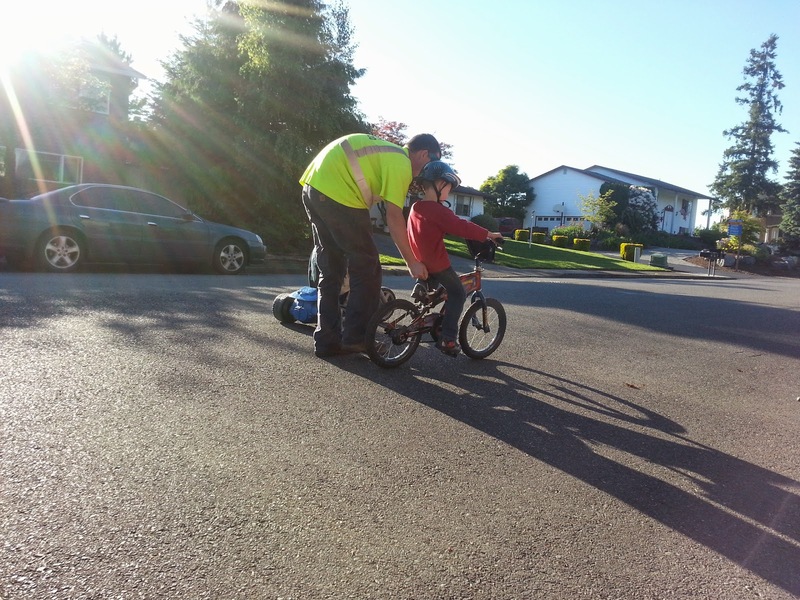 Zeke says, "Who needs to learn balance...just walk beside the bike!" A Penny Earned Is A Penny Saved! I remember being young and taking my round tin out of my room and dumping all the change on the floor and tediously counting out all the change into $1 piles. My kids are no different....they love to count their money. 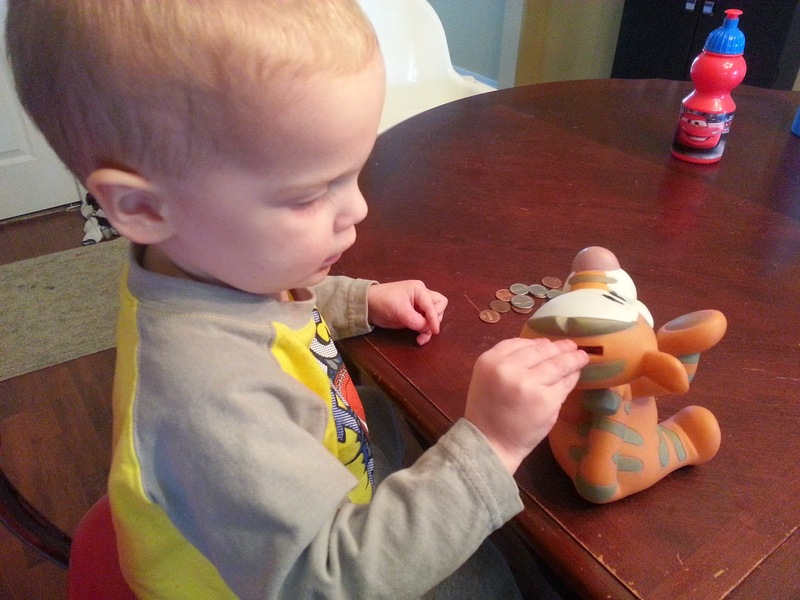 The other day Zeke came in from outside with a penny so I got down his Tigger bank so he could put it in to save. 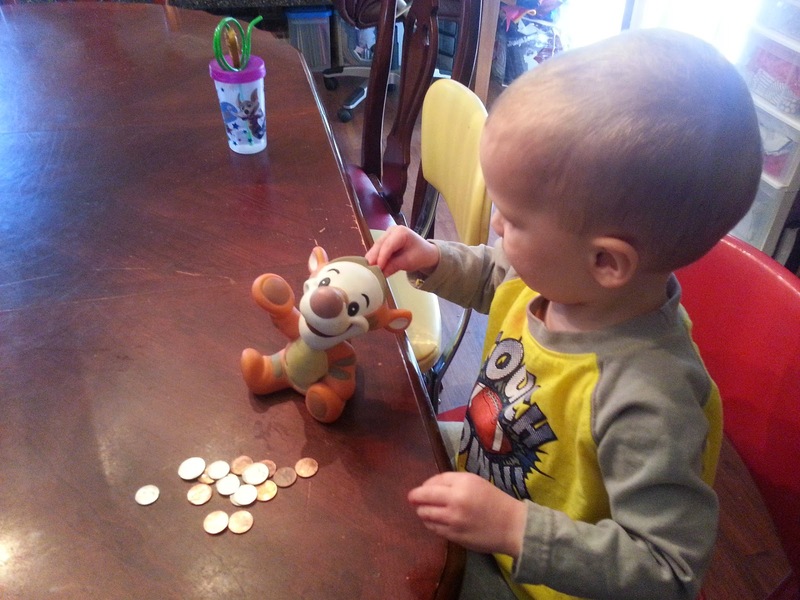 He wanted to practice putting more money in so I dumped some more money out for him. 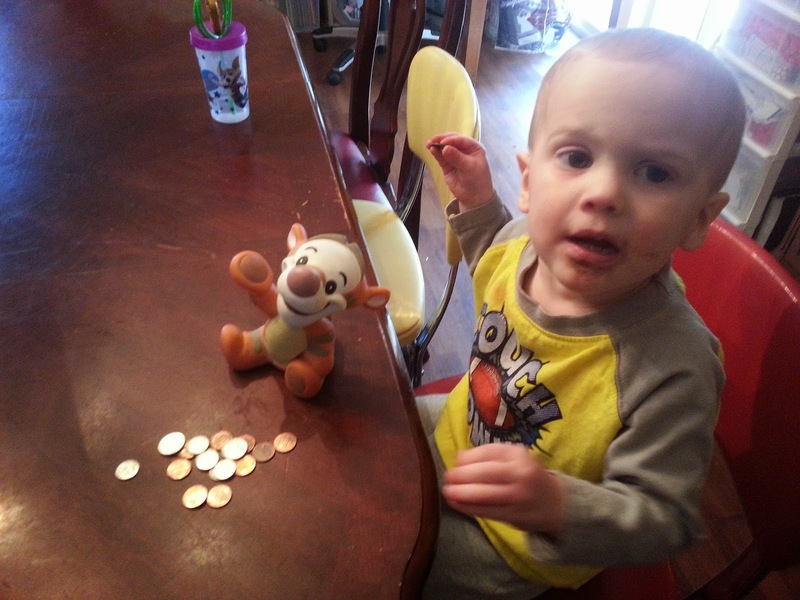 He had lots of fun using his fine motor skills to put all the change back it. When he was finished he handed me his bank and said, "All done!" 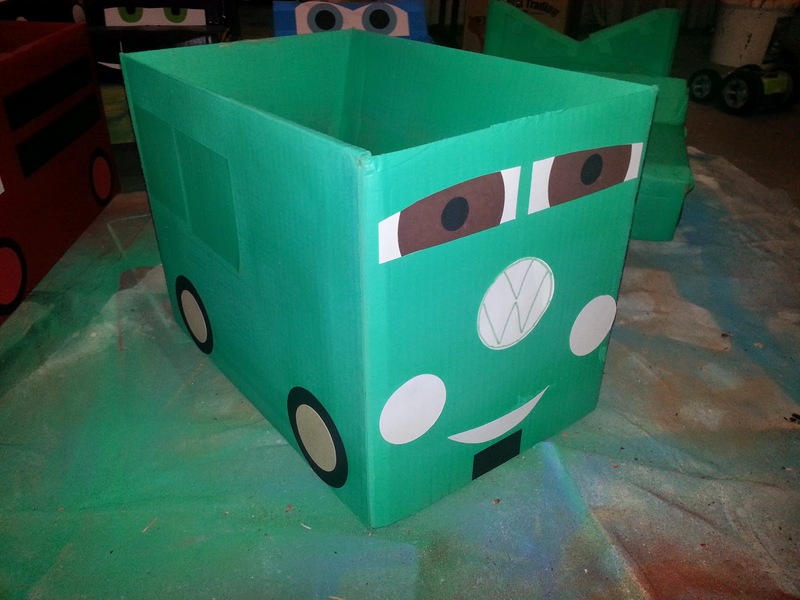 When I started planning for Zeke's Cars party I thought of lots of fun things to do, but most of them were for bigger kids....Zeke is only going to be two though! I wanted to think of things that would be fun for him and for the older kids as well. That's when I came up with the idea to have a "drive-in". 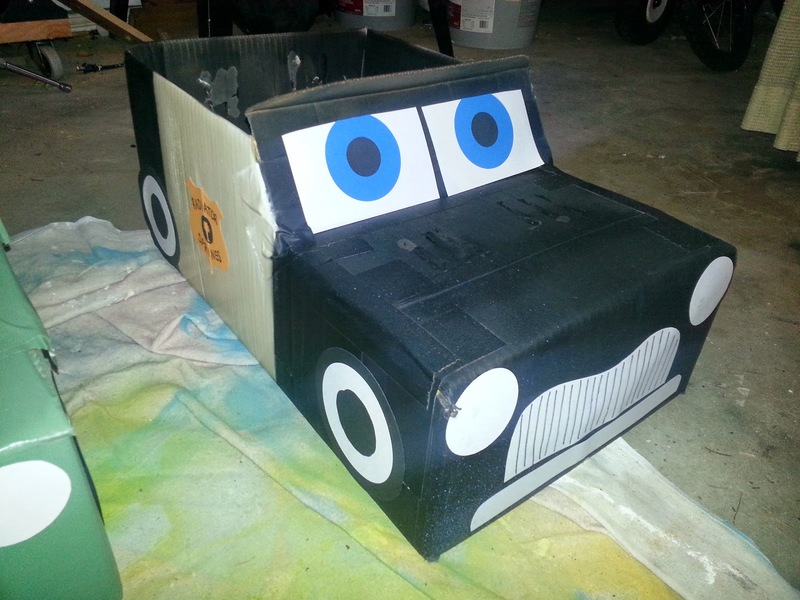 I went online and found a blog where the mom made cars out of cardboard boxes. 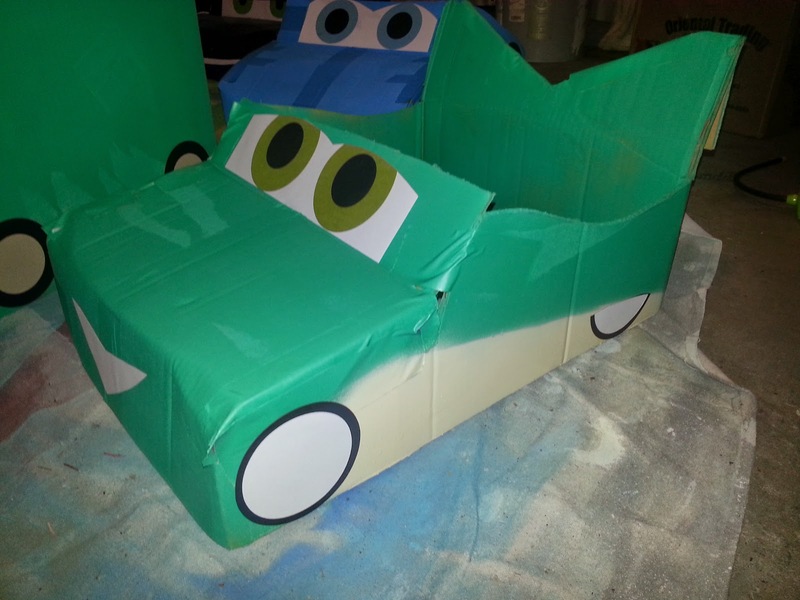 As if I don't have enough going on let's just add making 13 cars from cardboard boxes to it! Seriously I do this to myself, but I love it at the same time! 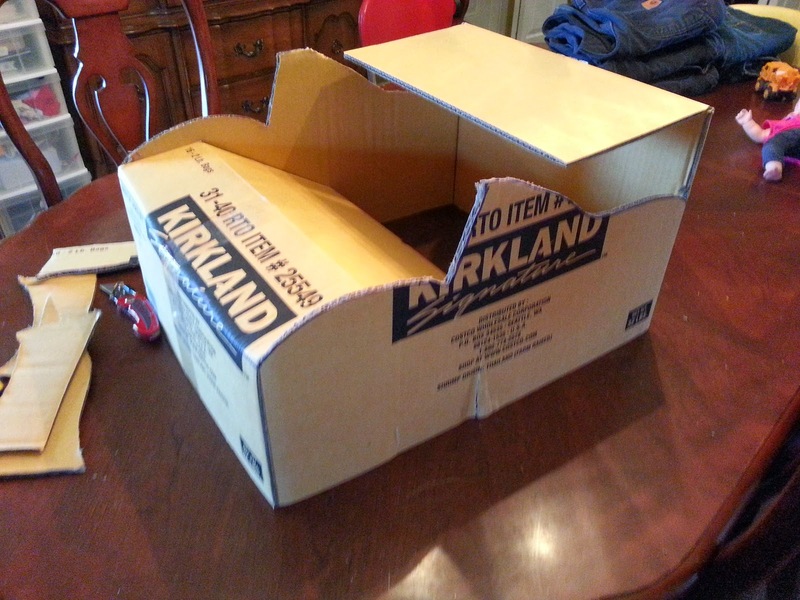 My biggest worry was finding the right boxes. I was sure I was going to have to hunt around forever to find them. Enter Costco! 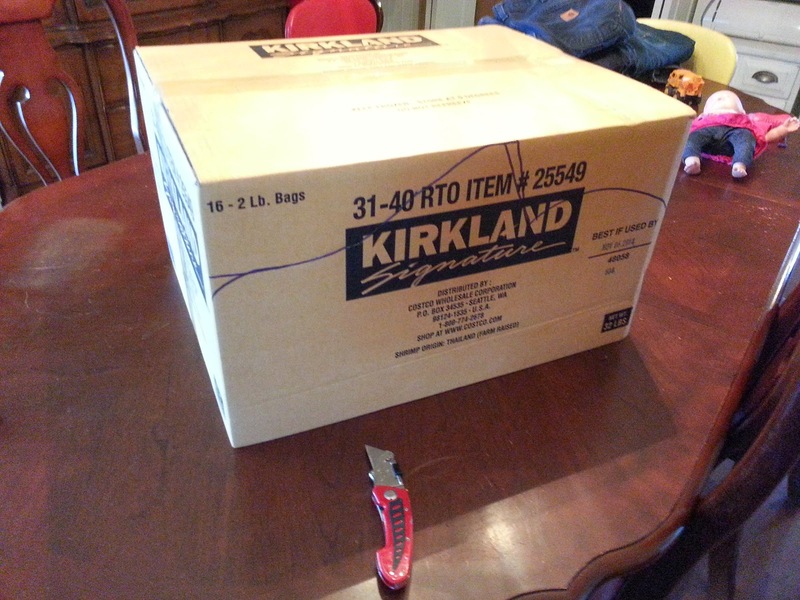 I guess I had never paid attention to the giant box towers over by the food court at our Costco, but I grab as many as I could fit in our cart and headed home. Next came the designing. I used the blog and the images of the different Cars for inspiration. 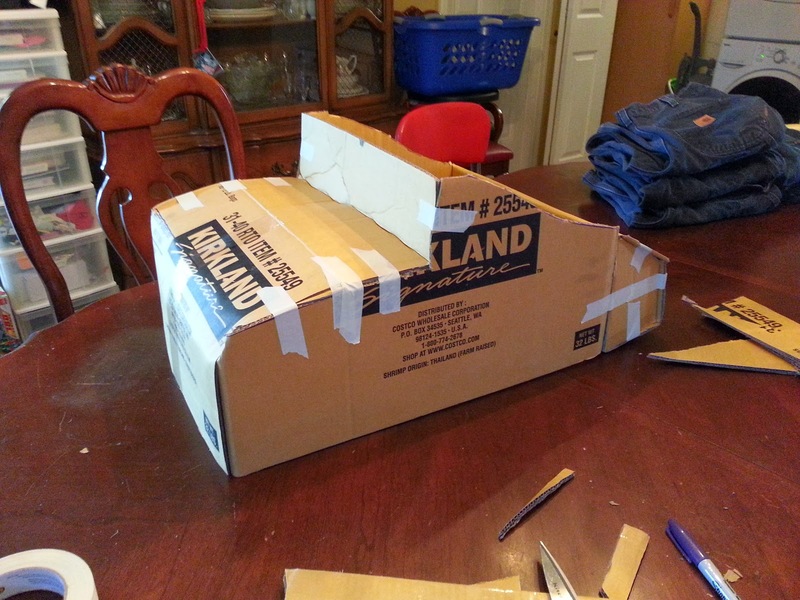 First I drew the outline of the car on both sides and then used a box cutter to cut them out. 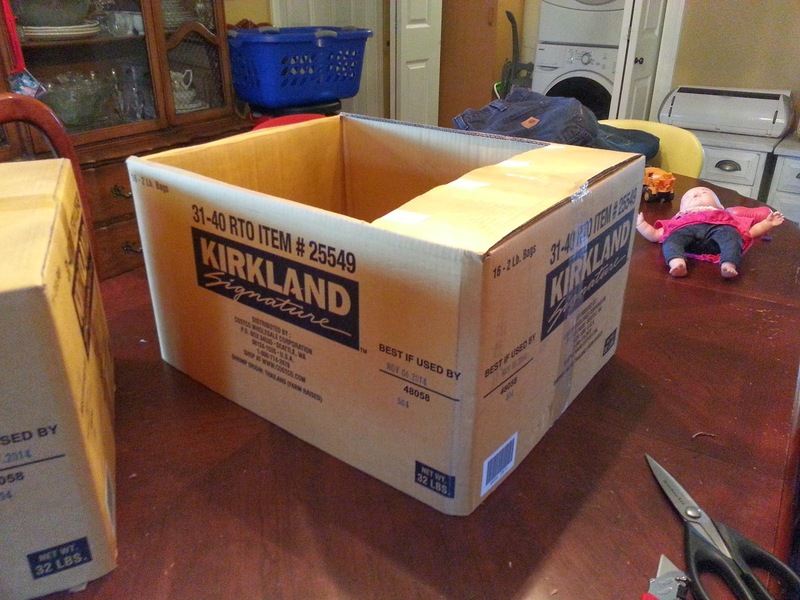 These boxes were nice and sturdy which was great since I would be really jeopardizing the structural integrity of them. 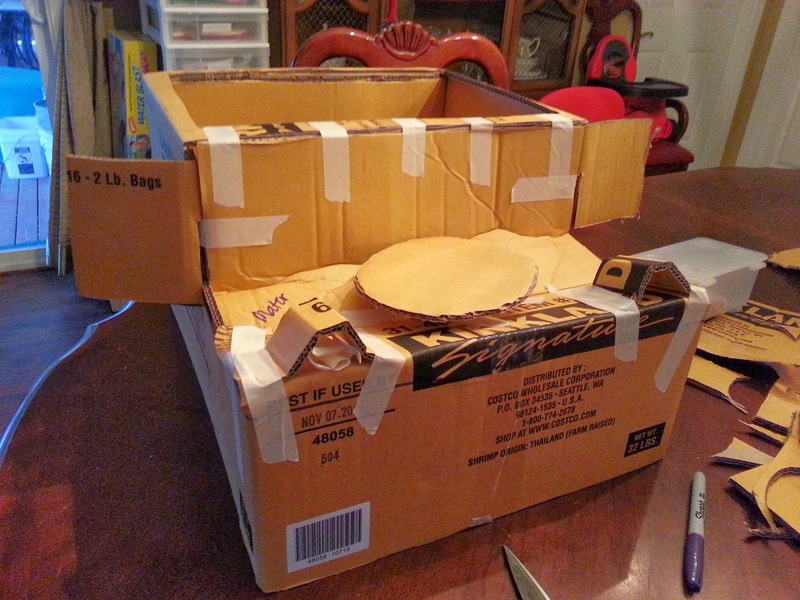 After the cutting came the folding and taping. 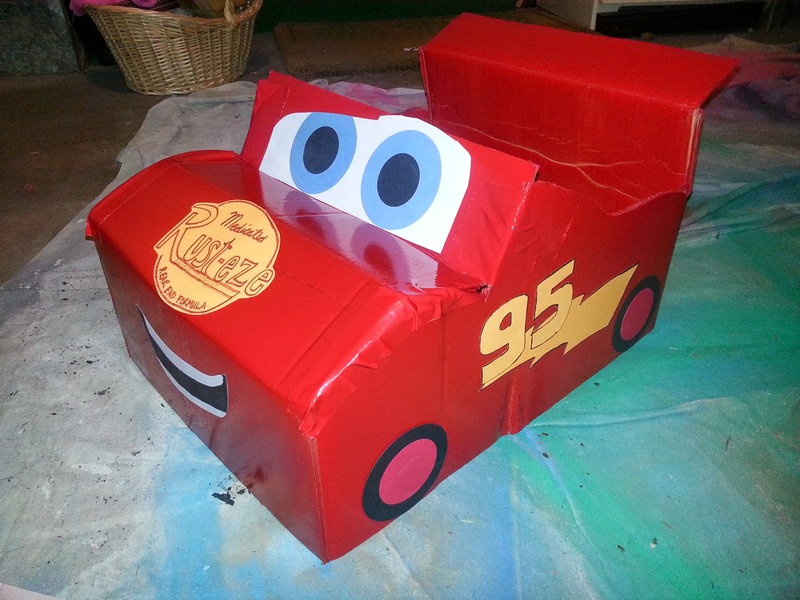 And here is the body of Lightning McQueen. I was super stoked with how easy it actually was...I was sure this was going to be so difficult. 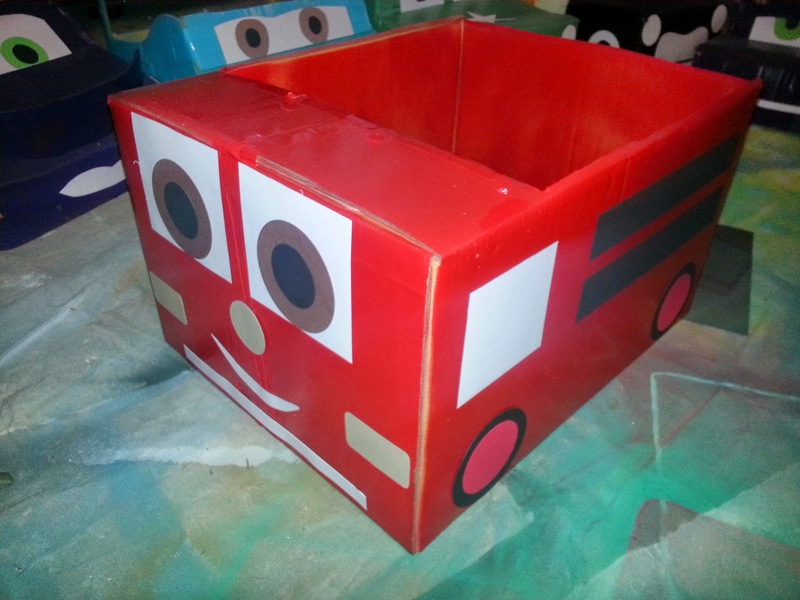 The second one was even easier...say hello to Red the firetruck! And her is Tow Mater...he was really fun! 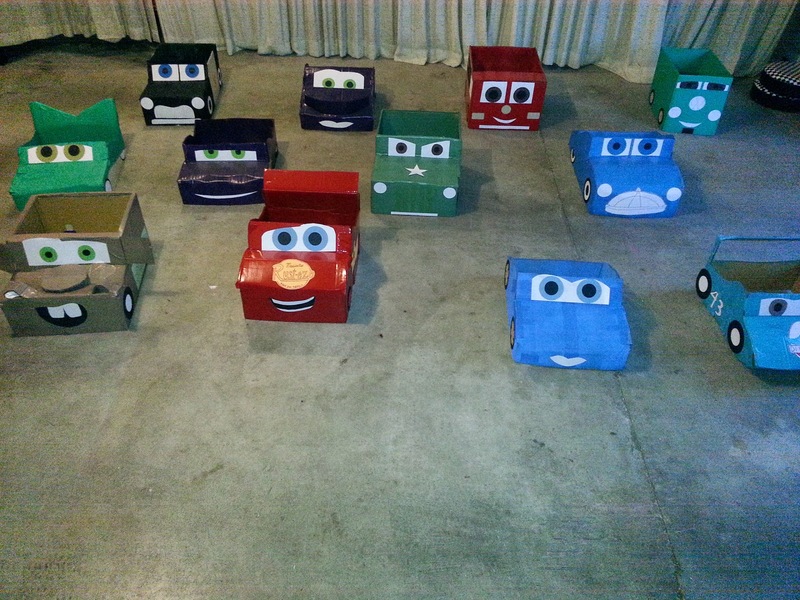 In one day I made 9 Cars - McQueen, Red, Sarge, Flo, Ramone, Doc, Sally, Holly and Tow Mater. 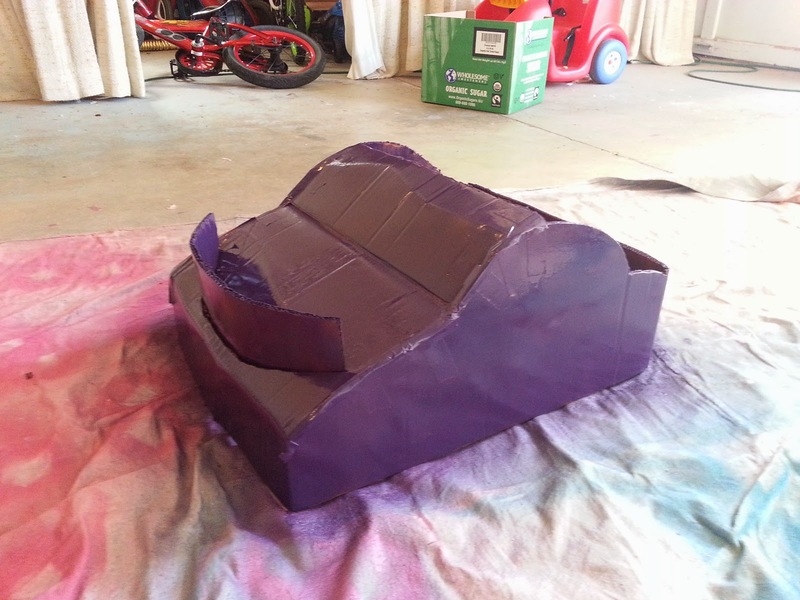 Here is Holley Shiftwell after her paint job. 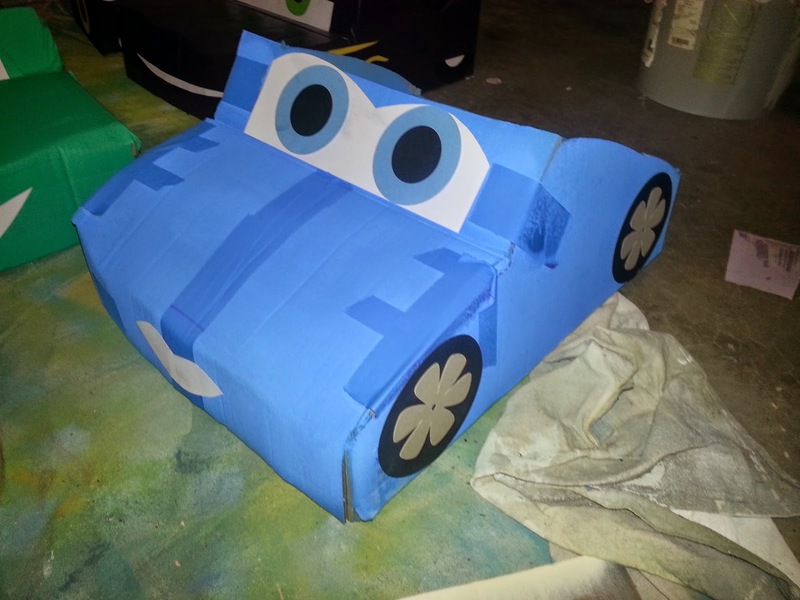 After the paint jobs I had to do the finishing work like the eyes, wheels and any extra decorations. 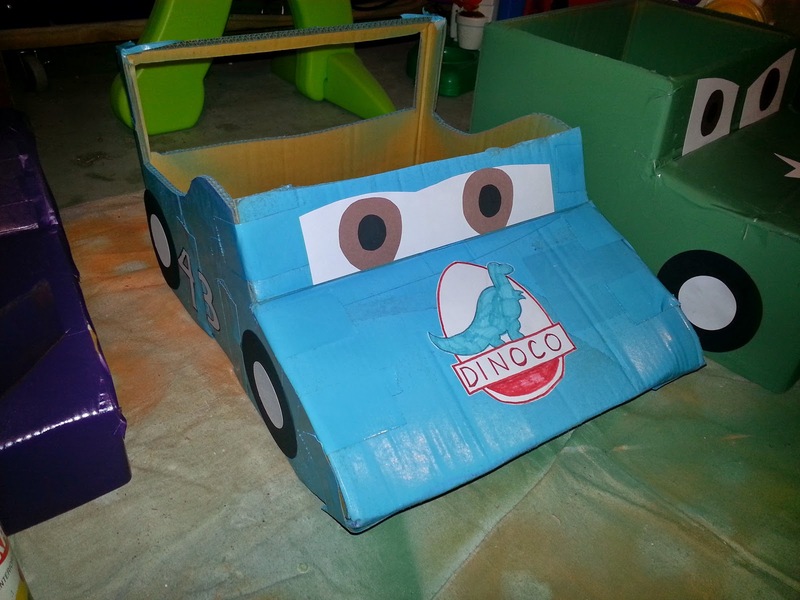 For King I just free handed the Dinoco symbol by looking at the King car we have. I think it turned out pretty good. For Ramone I just copied the flames from the images online and then cut them out. Tow Mater was the one I was most concerned about because of all the extras. I have to say....I'm super pleased how it turned out. He's so cute!!! Sarge and his angry eyes! Flo and her nice white (well off white) sides! Red was the hardest to make him actually look like Red from the movie since he's just a big square box. Fillmore turned out good. I didn't add any of his decorations on the sides because I was leaving that for the kids to do at the party! The kids ended up being so busy with other things that they never did decorate him. I guess I'll have my kids add the graffiti to him instead! Sally with her fancy wheels! Sheriff turned out really well. Jack was very insistent on him having that flap above his eyes like a sheriff hat. I had never noticed it before, but when I found our Sheriff car sure enough he has a little brim of a hat on top. Jackson is so observant! McQueen of course is my favorite one! He turned out awesome. During the course of this project I only spent $16 for 4 cans of spray paint...2 red and 2 aqua color for Fillmore and Flo. I need to return one of the cans of aqua since I ended up not using it so it will actually have cost around $12. 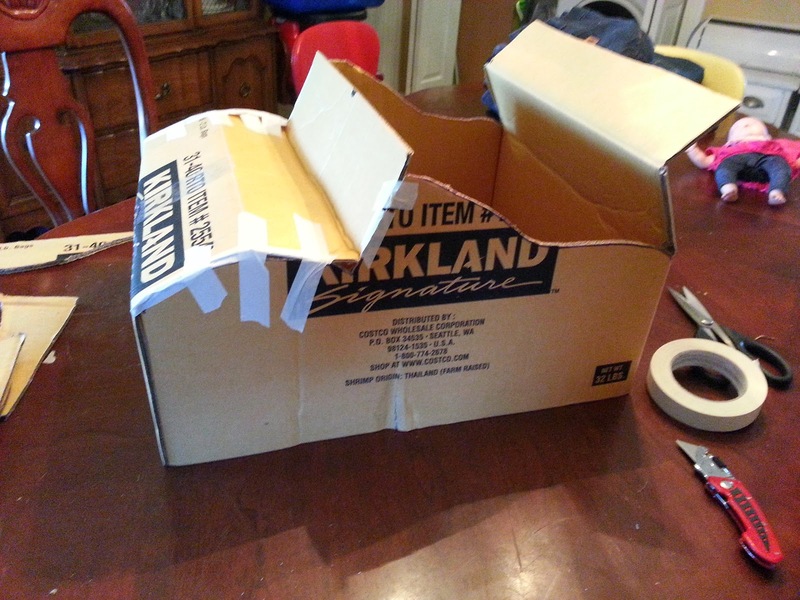 The boxes were from Costco, duct tape was from Pa and then I got a bunch of other spray paint from various people. When I first decided I was going to do this I told a bunch of people and then when I got to thinking about it I thought... what have I gotten myself into! I was sure it wasn't going to be possible, but I didn't want to go back on my word so I just toughed it out and I'm glad I did. I think the kids really enjoyed them! The day before Zeke's party I got the garage all cleaned up and ready for the drive-in movie. Our friend Micah came over and set up his projector, sound board and a white sheet to make the drive-in movie possible. Thank you Micah!!! 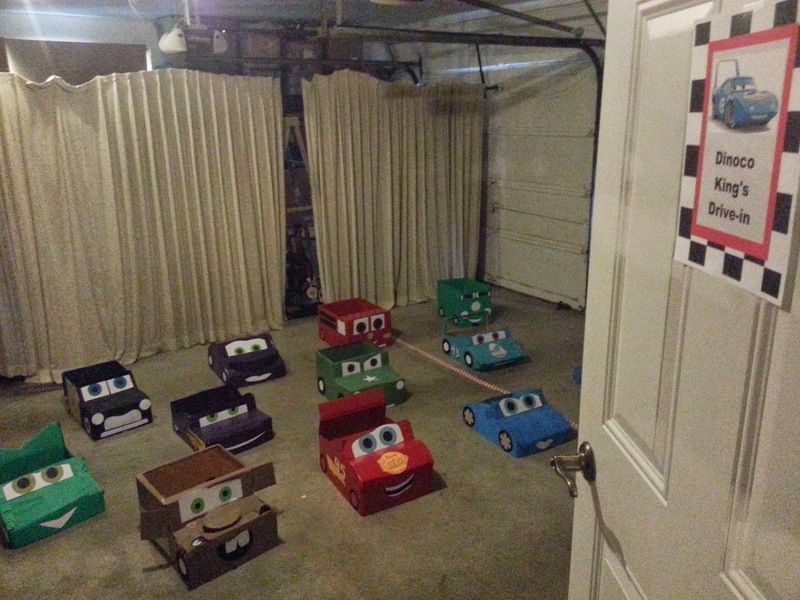 The Cars looked so cute all set up! There is a completely separate blog post coming about the Cars. On the door into the garage I put a sign that said...Dinoco King's Drive-in! After all the kids arrived I had them line up so I could talk to them about the drive-in movie and what was going to happen. The kids got to draw the name of their car from a bowl so there wouldn't be any fighting over what car they got or didn't get. 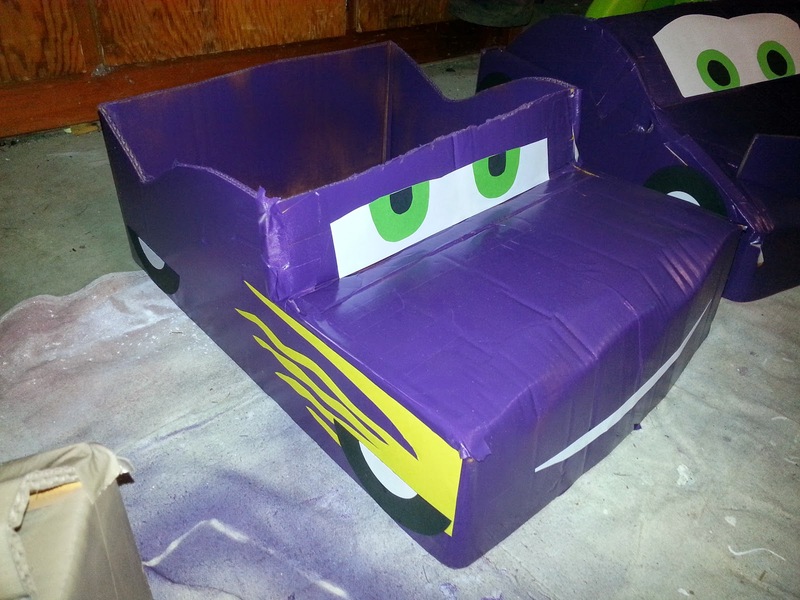 I did put McQueen's name aside since he was being saved for the Birthday Boy! One the kids came into the garage they got to grab a small bowl of popcorn and then find their Car. Unfortunately Zeke Man was not feeling very because of this cold that was holding on for dear life. He was coughing and was a bit whiny most of the day! I had lots of fun with the food and coming up with the labels that would correspond with the movie. Here is Luigi's Leaning Tower of Tires! Happy boy with his donut...I think it was the only thing he ate all night! Zeke is normally a Pa boy, but since he was not feeling good he was even more of a Pa boy today! Of course Pa loved every minute of it! Earlier in the day the weather was so nice, but as the party got closer the sky got dark and the clouds rolled in and it started to pour! I was super bummed since really the only game we had planned was an outdoor game. Thankfully after dinner the rain stopped so we took advantage of it. We were off to the races....The Piston 200! The kids brought all their cars outside and then they each got to run from the starting line to the finish line. Michael was at the finish line with a stopwatch. Each of the kids had their own Pit Pass with their name on it and then I would write in the time it took them to run the race. Jack decided he didn't want to race with Sarge so he choose Tow Mater instead. Zeke was not going to race on his own so Pa put McQueen over Zeke's head and then held him and ran. On Thursday when I had some trouble with the van I needed some help from the neighbors. While they were helping I mentioned the party and the race. They were so excited so they came and were spectators for the race. It was so fun! 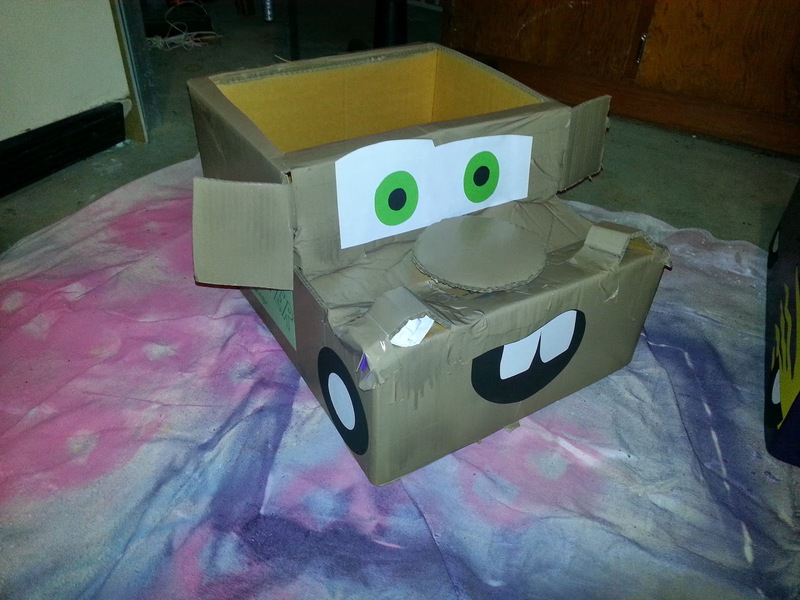 I thought it was fun how the kids had a sort of ownership of their cars. They knew which one was theirs and it was important that they had the right one. Thankfully we didn't have any injuries during the course of the race. I was going to have the kids do a craft project which was decorate Fillmore with graffiti, but we just didn't get around to it. Camryn did a great job racing in heels! Ella thought that race was code for Sunday drive! She was sure cute though! Camryn ended up winning the race. Her time was 4.17 seconds! She was a trophy that said "Winner Piston 200" and a 100 Grand candy bar! Even Pa & Uncle Ry got to take some cars for a "test drive"! 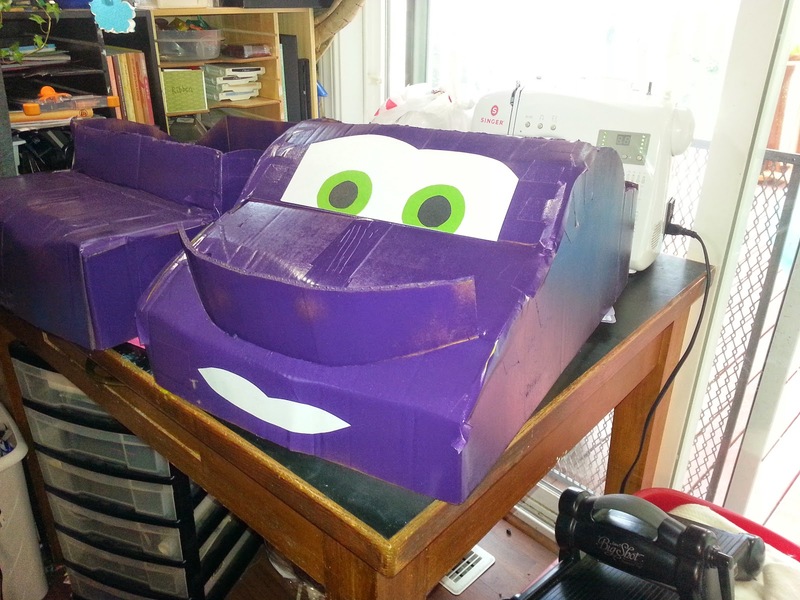 Since I was busy making Cars I knew that I was not going to make a big fancy cake this time. So I ended up buying an ice cream cake. Since Zeke was sick we cut his piece off the cake so he wouldn't blow his germs all over the rest of the cake. Jack spent his own money and got Zeke a brand new Lightning McQueen. He did not let it go! Uncle Ry & Aunt Stephie got Zeke a McQueen helmet. 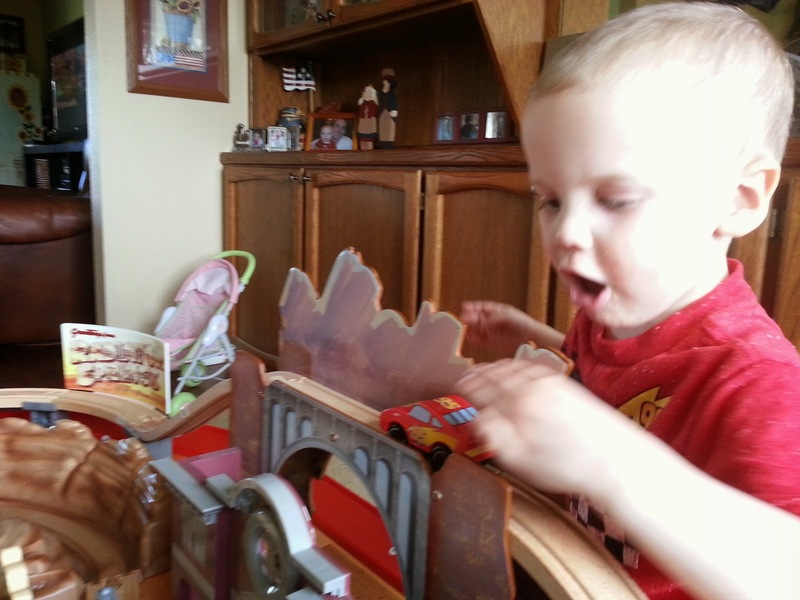 I got Zeke a McQueen backpack, lunchbox and bicycle that I found at the Mill Creek garage sales. He also got a board book, McQueen swim shorts and money! 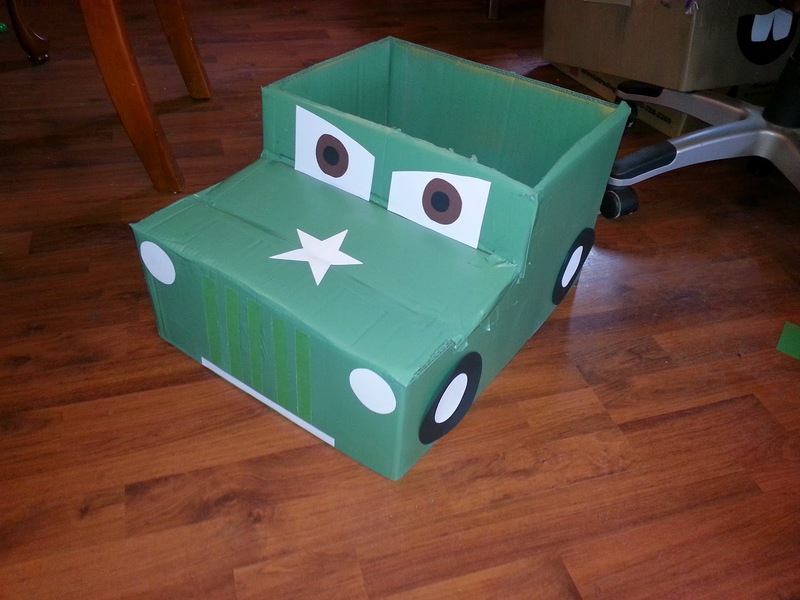 Ga-Ga & Pa got Zeke this Cars table. I actually found it on Craigslist in Canada, but that didn't work out. Then I found a guy that had one and he lived in Longview. He actually worked at Fort Lewis so we met there. It worked out perfectly! 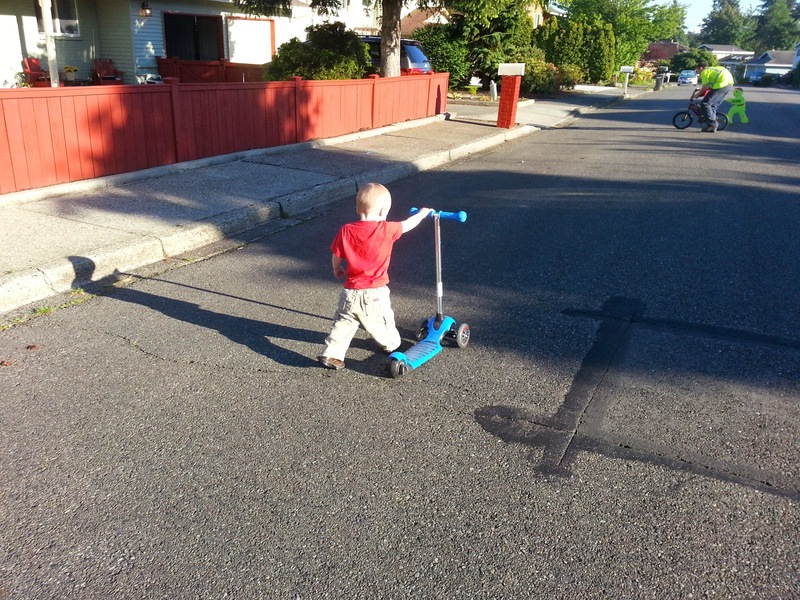 Zeke drove around with his new McQueen! As you can see from his face he is not too sure about sharing his birthday present! You know the saying....sing with me now...It's my party and I'll cry if I want to! No birthday party is complete without tears!